Deepa of Recipes n more asked me if she can send a secret ingredient as part of the Arusuvai Friendship Chain and I instantly accepted the offer. I was more than happy and thrilled at the same time. I was waiting for the surprise ingredient and wondering if I can find out what the ingredient would be. I was so happy to receive a packet from her which had the secret spice plus a beautiful card plus a crunch chocolate bar. Just closed my eyes and tasted the spice powder that she sent me. My first guess was right. It was Milagai Podi. I double confirmed it with my husband and triple confirmed it with her. It is so tasty and spicy. We had Dosa Milagai podi for the dinner that night. I got an idea of mixing the milagai podi in the iddli dosa batter. Just tried and it came out so well. Thank you so much Deepa. 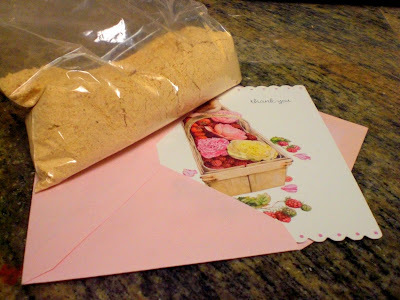 Here is how I prepared the Mini Iddli and Mini Dosa using the milagai podi that she sent. 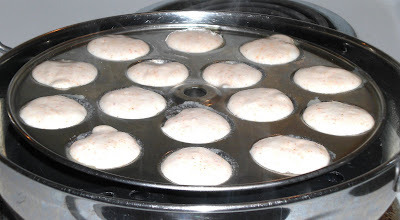 Mix the milagai podi in the batter and perpare mini iddlis using mini iddli plate and prepare small size dosas. 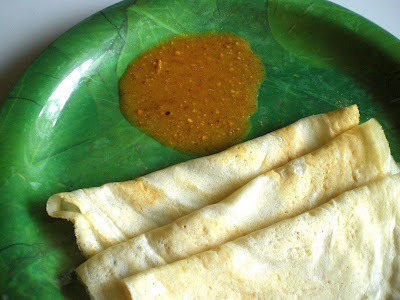 You can also prepare dosa first with the ordinary batter and garnish all around with milagai podi. Serve warm with a cup of thick yogurt/curd. Those are so cute and great party dish :) Looks awesome. 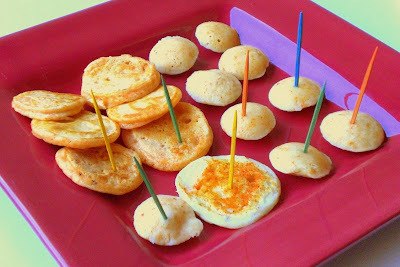 Mini idlis and dosais never fail to please, with the milagai podi just simply tasty. Idlis and milagai podi, what a heavenly combo...yummy! i still go craze for this mini idlies. those dosa's are also looking cute. Mythreyee, the entire plate looks lovely and so cute, I am sure my daughter will love this...you can this to my dosa mela if you like..
that's a great way of using the surprise ingredient, Mythreyee! Love the mini idlis and dosas. U r an awesome cook Myth! Know what? We r going on a long road trip and I am preparing ur Tomamto thokku now!! this is so awesome mythree...very happy that u like the podi a lot ! !cheers to you !! !